The future of 3D printing is bright and is an increasingly important pillar in the manufacturing renaissance. With the increased usage of the technology, conversations about additive manufacturing are a lot more tangible than they were just two years ago. Before, we were debating whether there is a financial or technological case to convert from traditional, high volume processes to an additive printer. Now, there are growing numbers of use-cases and demonstrable business benefits proving that additive can be used as a mainstream manufacturing technology. What can be done with 3D printing isn’t theoretical anymore; it’s fact. 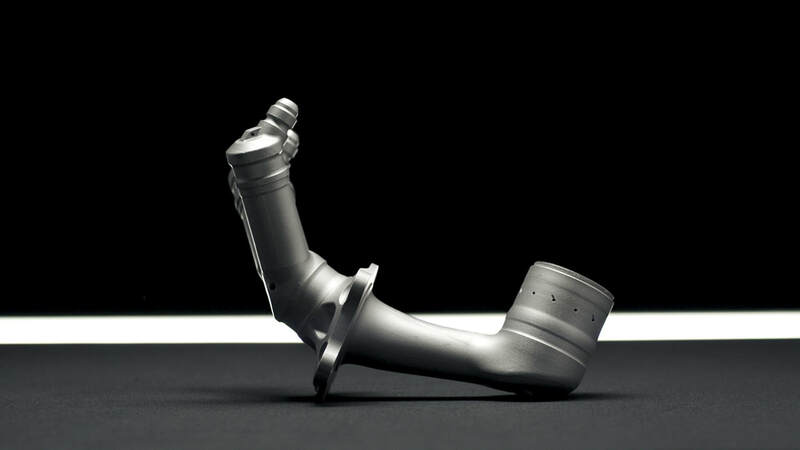 Several industries—including healthcare, automotive and aerospace and defense—have been experiencing impactful production and business transformations within key areas of their business given the maturation of additive technologies and material supply-chains. For instance, interior aircraft parts like ducting, vents and airflow systems created with additive manufacturing permit designers to trim weight, reduce the number of components in assemblies, and conform to tight cabin interiors. In addition, additive provides design freedom to experiment with more effective and efficient part shapes, with fewer potential points of failure. These give manufacturers more flexibility in creating their products all while keeping pace with contracting production cycles. In a recent survey conducted by Jabil, we discovered that in just over a year, the number of companies utilizing 3D printing as well as the variety of applications rocketed dramatically; the percentage of companies using additive to manufacture production parts rose from 27 percent to 52, bridge production increased from 23 percent to 39, and repair went from 14 percent to 38. Although the 3D printing industry is currently worth around $9.3 billion, a report by Smithers Pira predicts that the additive manufacturing industry will be worth $55.8 billion by 2027. Download the full Jabil survey report. 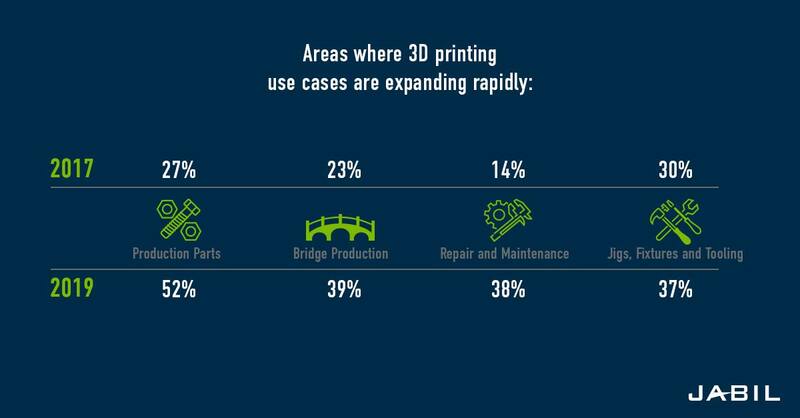 3D printing use for bridge production has grown 70 percent in just two years. In that time, automotive, transportation and heavy equipment industries have been the most frequent users of the technology for this purpose. Additive manufacturing allows for easy scalability from prototype to full-scale manufacturing. After all, prototyping without the vision and expertise to go into full-scale production misses a key tenant of what additive stands to deliver which is more efficient life-cycle management. When volumes are still relatively low, if a brand is looking to print 100 parts for engineering testing, for instance, it’s easy to do so with additive manufacturing. Even quadrupling that number can be done with no added retooling costs using 3D printing. Additive is the perfect fit for low to mid-volume production. With the right level of planning, engineering, and material development, a part developed using additive can seamlessly transition into rate production equipment such as injection molding. Producing a part on-demand with 3D printing enables manufacturers to print parts as needed instead of pulling the part from a supply warehouse. On demand production will help companies realize huge reductions in inventory and storage costs. In the automotive industry, for example, spare parts inventory could be reduced by 90 percent with 3D printing, according to a report from MIT. Today, we’re moving from a capability conversation to capacity conversation. But in the future, 3D printing will be able to support all facets of new product introduction (NPI) where scaling volume to achieve price points will become decreasingly important. Additive manufacturing is leading the way in the digital transformation of Industry 4.0. It’s one of the purest digital technologies because it doesn’t require tooling and fixturing, thereby eliminating or reducing switching costs in moving a file to different locations and printers. That’s a radical departure from labor-intensive methods employed by the manufacturing industry over the last 200 years. In fact, the most disruptive aspect of additive has little to do with the actual printers—it’s the conversion of a digital form into a physical good, meaning a file that has a representation of the final product you want. 3D printing is the first step on the journey to digital transformation. Rather than stocking a warehouse full of parts that might become obsolete and mass quantities of spare parts that may or may not be in demand, additive manufacturing condenses the piles of boxes eating up physical space into digital files that can be stored in the Cloud and easily accessed if they are ever needed. In addition to digital inventory, distributed manufacturing is also changing how companies are incorporating 3D printing into their digital strategy. Instead of considering a centralized solution, distributed manufacturing enables companies to decentralize production so they can manufacture the final product closer to the customer. With 3D printing, manufacturers can better connect the physical supply chain with a digital thread and manage products more efficiently from concept to end-of-life. Manufacturing can be distributed to any location that has digital manufacturing systems in place simply by sending a file. This decentralization enables a more collaborative, transparent and efficient supply chain. If a natural disaster hits, additive manufacturing will be able to right itself and move forward much more quickly than traditional manufacturing. In the future, a hybrid version of manufacturing will include large factories, as well as larger numbers of smaller sites with 3D print farms, or even printers being deployed in alternative locations, like service and support centers, distribution centers, or even in people’s homes. 3D printing will eventually become simple enough that most households will be able to pull files and print a product with just a few flicks of their wrists, like 2D printing at Kinko’s a mere ten years ago. We’re already on this course, and we’re just beginning to distribute closer to consumption and becoming more agile. Not too long ago, the battery case on one of my son’s toys broke and I 3D printed a new one. It’s starting to reach the point where you wonder, “What can’t we print?” And when we start to dissect everything down to the molecular level, it’s just a matter of time before individual consumers can print food or glasses frames or…well, anything. In the future, 3D printing will empower more consumers. Slant 3D offers high volume production of 3D printed parts as an alternative to injection molding. Simply submit a 3D model of your file and our engineers will work with you to get it quoted for production. A prevailing consumer trend that we have noticed across many industries is the desire for personalization. Rather than purchasing a mass-produced item, customers are more frequently wanting a product that is created for them specifically, gratifying their personal tastes and preferences. This is enabled by additive manufacturing’s ability to offer low-volume production. 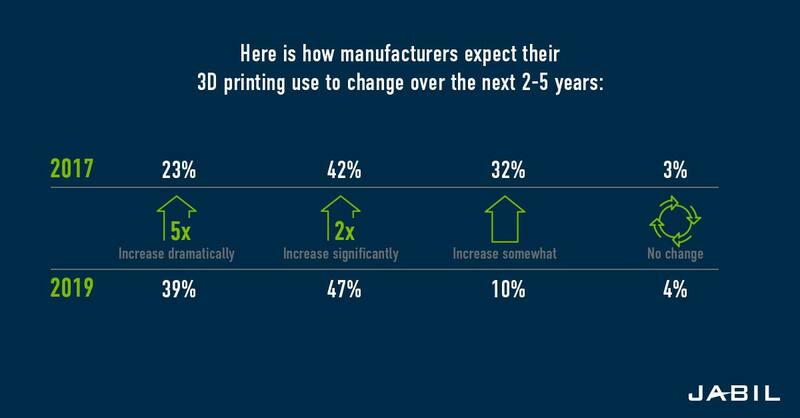 3D printing gives manufacturers more flexibility in responsive design. Instead of having to hoist large quantities of identical objects onto the public, they can afford to produce smaller batches, allowing designers and engineers to adjust product designs and innovate in a cost-effective manner as inspiration strikes or customer feedback trickles in. While substantial investments in the additive manufacturing ecosystem are fueling growth, I don’t think you can overstate the significance of the materials. Outside of the high cost of the equipment, the next big barrier is materials and the closed ecosystem which has stymied the industry’s growth. Numerous types of 3D printing materials are on the market today, but very few are advanced enough to meet the quality or regulatory requirements of every industry. With current challenges surrounding volumes in most industries, suppliers and manufacturers aren’t incentivized to create the materials necessary for new applications. However, I believe that the future of 3D printing is in materials—specifically engineered and application specific materials. The different needs of diverse industries all require custom solutions to their problems. Integrating new engineered materials will transform a new generation of applications, including heavily regulated industries. Finally, two of the key tenets to additive manufacturing are sustainability and conservation. One of the intrinsic benefits is that scrap material is reduced, if not eliminated. As Simon Ford and Mélanie Despeisse point out in their essay, “Additive Manufacturing and Sustainability: An Exploratory Study of the Advantages and Challenges,” additive manufacturing mimics biological processes by creating objects layer by layer, rather than produce a hulking item that must be whittled and chunks carved out to achieve the desired shape. “It is inherently less wasteful than traditional subtractive methods of production and holds the potential to decouple social and economic value creation from the environmental impact of business activities,” they write. Aside from reducing waste, 3D printing also conserves energy. The Metal Powder Industries Federation did a studythat listed 17 steps required to produce a truck gear using subtractive manufacturing versus the six steps it takes to accomplish the same task with additive manufacturing. With 3D printing, the same product took less than half the energy. 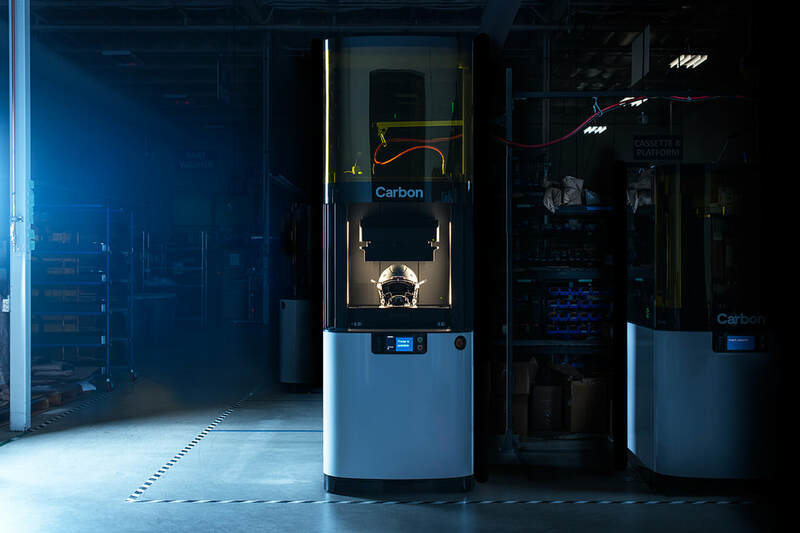 Additionally, by bringing products closer to the customer, 3D printing reduces the need for transporting products and materials, thereby positively affecting the quantity of carbon poured into the atmosphere. Therefore, the future of 3D printing will lead to a more sustainable future overall. This is a pivotal time for the manufacturing industry. We’re standing at an epicenter where we don’t have a fully mature technology, both in the physical representation and the printers and how we want to manage everything on the digital side. But additive manufacturing is demonstrating its transformative nature and has already begun to reshape businesses. Whenever a mold is a created a design is literally set into stone. This means that the product cannot be changed without starting from scratch and paying for the cost of a new mold. For new products and new companies that cost of the mold is a single up front cost worth thousands of dollars, that might be unusable. Molds are also difficult to design for. Shrinkage, draft angles, and general geometries are all factors that severely constrain design of injection molded parts. And the application of textures is either expensive if integrated into the mold or must be done in post processing. If a product is not well proven, with preorders or customers guaranteed to buy it, injection molding is not a good option, because it is a high up front cost, to create a product that might not address the market and needs to be redesigned. 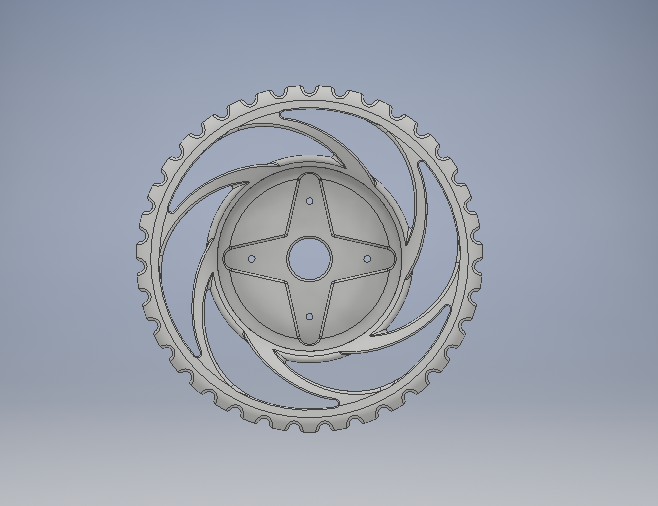 The wheels for the toy above, were produced by Slant 3D. The client begain with a simple solid wheel. But about 30% of the way through production they changed the design to the "spring-hub." All they had to do was send the new file and within an hour the parts being produced were updated to the new design. No time or money lost in retooling. Production 3D Printing solves the inflexibility in injection molding. Additive manufacturing, or production 3D printing, fixes the inflexibility of molding. High volume production of 3D printed parts allows for the production of as large of quantities as injection molding. But, since there is no tooling required to make 3D printed parts, products can be updated and changed at anytime during production. Instead of paying thousands of dollars for a new mold a client just e-mails a new file. Then every part off the line from then on is that upgraded part. Production 3D printing also has the benefit or allowing production of more varied and complex geometries. That is not to say that there are not "best practices" when designing for additive, there are. But there is still far more freedom in the design of part than injection molding. Textures can be applied for free. Internal cavities and channels are possible. And parts can be implanted inside of the part during the process (especially with FDM). 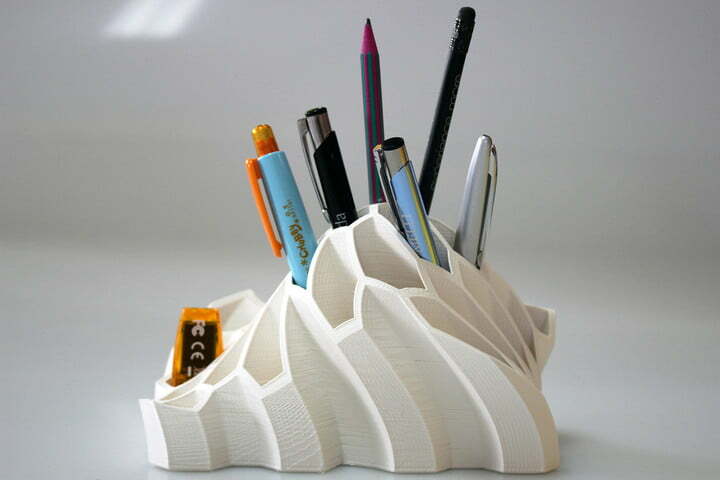 Curved and Organic shapes like the 3D printed pencil holders shown below are also feasible with additive and impossible for molding.. Within this discussion of the flexibility of high volume production 3D printing vs. molding there is also the question of time. The time lost in in retooling can put production behind days, weeks, and even months. These all have a cost associated with them. The fact that additive manufacturing is able to almost instanteously update and continue saves all of the effort. Lastly there is the question of delivery schedule and Just-In-Time capabilities. Molds are intended to be used for very large runs of parts. This means that clients must makes large quantities and then store them, regardless of demand. Production 3D printing does not have this problem. Parts can be produce precisely at the rate of demand, ramping up and down as needs. Additive can make 10,000 parts one week, and 2000 parts then next without extra cost. This also decreases warehousing fees and losses from unsold inventory. Molding is a great technology for products intended to sell millions of units, without update, for relatively large periods of time. But in a world where product optimization and addressing customer feedback can mean the difference between success and failure, especially for more niche or specialty products, additive manufacturing is clearly a better option. Slant 3D produces 10,000's of parts every week for clients ranging from startups growing their first products to corporate clients, like amazon, implementing new lines. We are here to help you make you product successful with large-scale additive manufacturing to let you go from 100 parts 100,000 parts. Just send us a 3D model of your part to get started and one of our sales engineers will get in contact with you with a quote. Recently the public got a rare view of the Slant 3D 3D printing factory. Dee Sarton's "Keepin' it Local" Segment came to one of our 3D printing facilities and was able to discuss how production additive manufacturing was growing in Idaho and is helping businesses ranging from startups to Amazon. 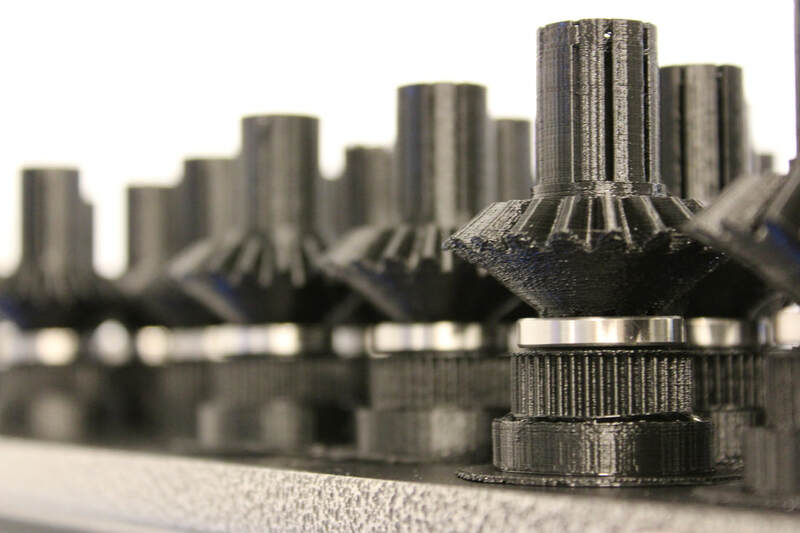 One of the largest advantages of the FDM printing processes used by Slant 3D, when contrasted with methods such as SLA/SLS, MJF, or injection molding, are our abilities to embed 3rd party hardware into the parts to create a strong and permanent assembly. This capability give the assembly longer life and reduces production costs because there is no secondary assembly and fasteners that can fail. Parts with bearings added during the process to to avoid the need for a more complex assembly. Bearings are added halfway through the print of the part. 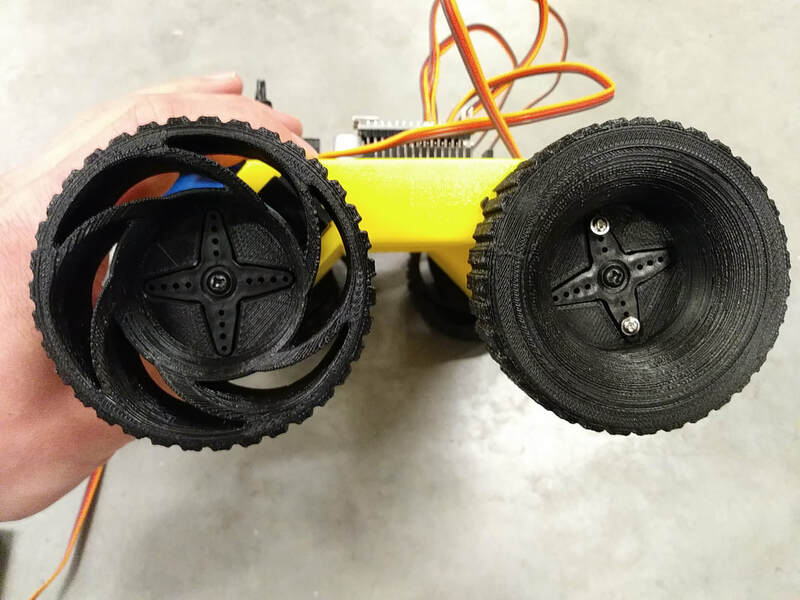 Embedding bearings, electronics, LED's, motors, fasteners, and in the past beads in a baby rattle, are a common option for production 3D printed parts. But it does often require rethinking of the design of the part in order to accommodate the addition of parts during the process. After all we are literally growing a part around another part. The way the 3rd party parts are added is by pausing the process at key locations. Slant 3D technicians will then place the hardware into the parts and the process will continue to finish encasing the 3rd party hardware. While this process of addition is generally determined and engineered by Slant 3D, it is useful to understand in the context as it can help with the design of the cavity that the part will be placed in. Things to consider include clearance of the nozzle and how the part will lay as it is being buried. Below are some common profiles and when, relative to the layering, the part would be added. There is a great deal of variability in the capabilities of engineering production 3D printed parts to have embedded hardware. So it is ideal if you include Slant 3D in your design process as early as possible. Our engineers can guide you through the design and make suggestions to the optimize the design for the process. Feel fee to contact us or submit the current iteration of your design and we will provide a quote and design feedback within 1 business day. UnCommon Lamps is a client of Slant 3D that makes use of our digital inventory and fulfillment capabilities. 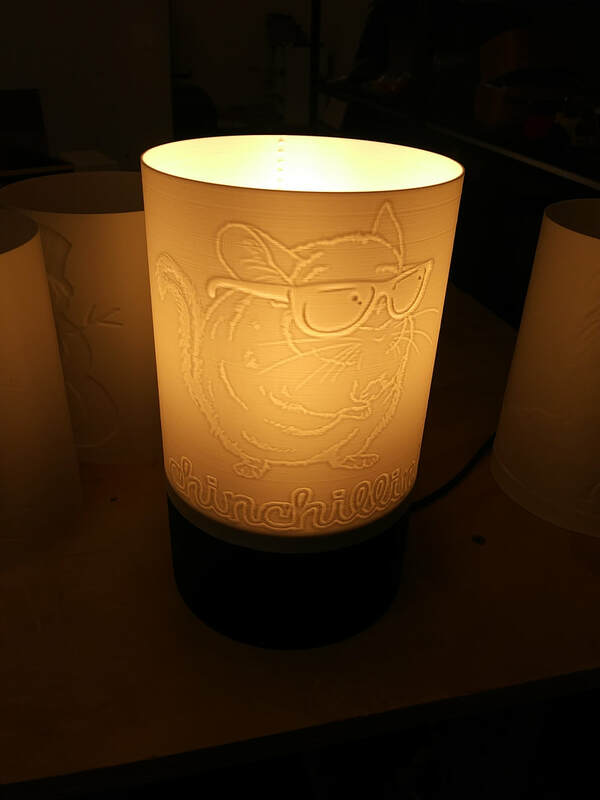 They design and custom Lamps and shades to pursue ultra-niche tastes and provide influencers with branded merchandise that is something other than T-Shirts and Mugs. How it works is Uncommon will receive and license artwork. They then use their processes and designers to integrate that artwork onto 3D models of lampshades. Once the design is complete they send the files to Slant 3D for integration into the 3D printing farm. 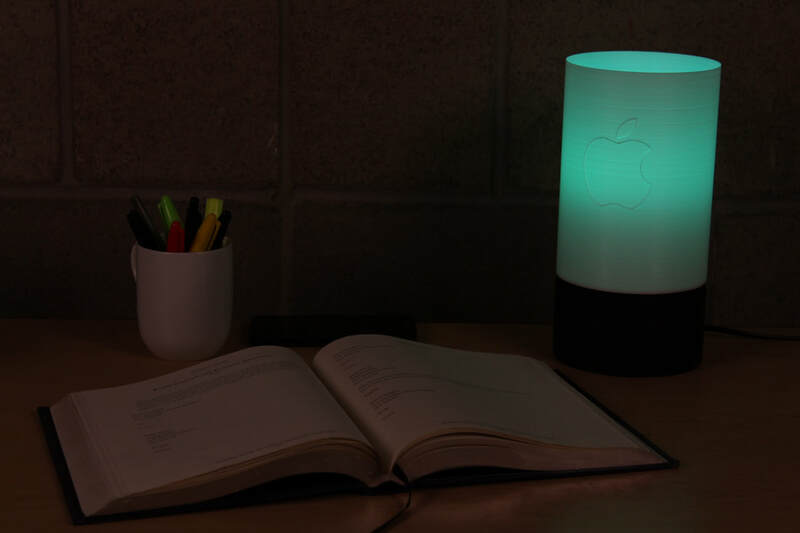 Once an order comes in it is forwarded to the farm and the lamp is produced and shipped within 1-2 days. Uncommon is essentially the equivalent of an app developer. But instead of making apps they are making 3D model files. They have no expenses on production until an order it placed. At that point they essentially a receive a royalty for each sale. While on-demand production 3D printing is a great resource for hardware designers, there are some technical pointers that any designer should take into account when creating a group of products. There is a setup process and optimization that should occur when integrating a new 3D printed product. The best way to minimize this is only change a single feature of the product between SKU's. Or even better, create a basic foundation that designs can be imprinted on. In the case of Uncommon Lamps. They use the same size lampshade and base for every shade. They only change the imprinted design. This ensures that every new design can be produced without changing the production parameters. 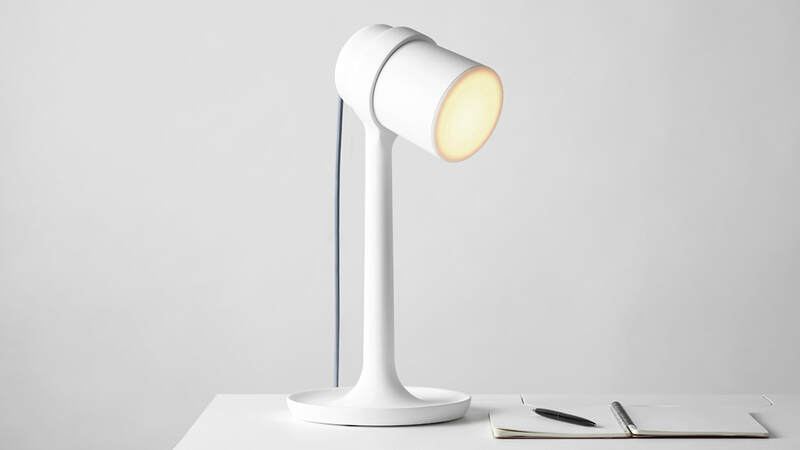 So each new lamp does not have to be prototyped and there is now change in per-unit cost between individual designs. Interested in having your products manufactured with production 3D printing? Submit your design for quoting to Slant 3D. One of our sales engineers will get you a quote within 1 business day. With the new year are coming many new changes for Slant 3D and our production additive manufacturing capabilities.. The largest of which is our expansion into a brand new facility that is bigger and better than before. We have more than doubled our footprint with an eye on more than doubling our already impressive capacity. Slant 3D currently is one of the highest volume producers of 3D printed parts in the world. Making in excess of 10,000 3D printed parts per week. We have created a truly viable alternative to injection molding. Production 3D printing not only saves the cost of tooling in the manufacturing of new products, but it offers more design fluidity than any other process. Our clients are able to iterate during the production process and create products that are more internally complex and strong than any other process can create. Since our inception Slant 3D has been working to improve the standards of 3D printing of large volumes of parts. We are going to continue to do this with new supplier partnerships and internal projects for the development of materials and processes to ensure top quality results every time. We also continue to expand the materials that we support. While clients can request any material they need for their project we currently natively support materials ranging from bio-degradable PLA to carbon-infused nylon and UL-94 rated ABS. We are also expanding our team. Slant 3D will be expanding our production staff and engineering resources to ensure that clients have every resource available when going through the production process. More updates will be coming in the future. But for now let's just say that we are very excited about 2019. For years branded products have been limited to Tee-Shirts and keychains. Simple items that could be printed on with ink. But with thousands more brands and creators working to be unique in the crowded space of branded merchandise, two or three core products are not enough. Afterall how many useless tee-shirts can individuals store in the bottom drawer. 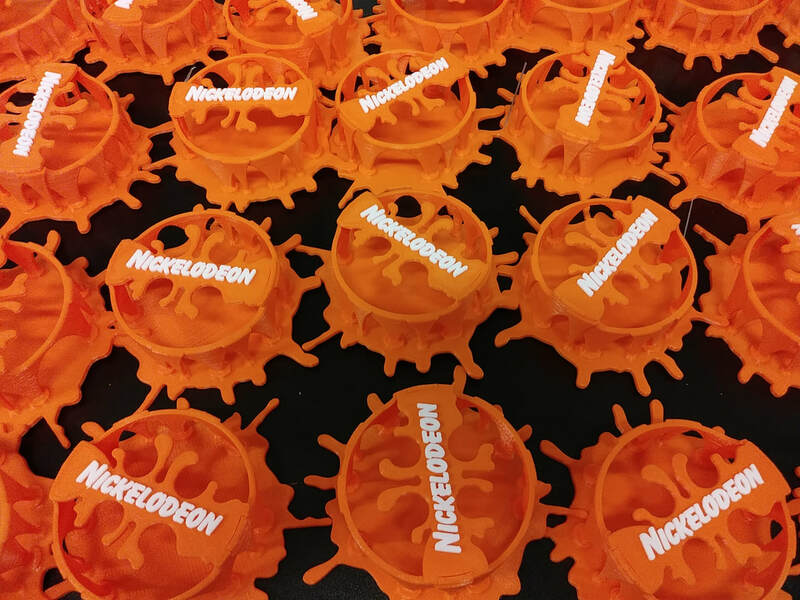 Nickelodeon Branded Amazon Echo cases. 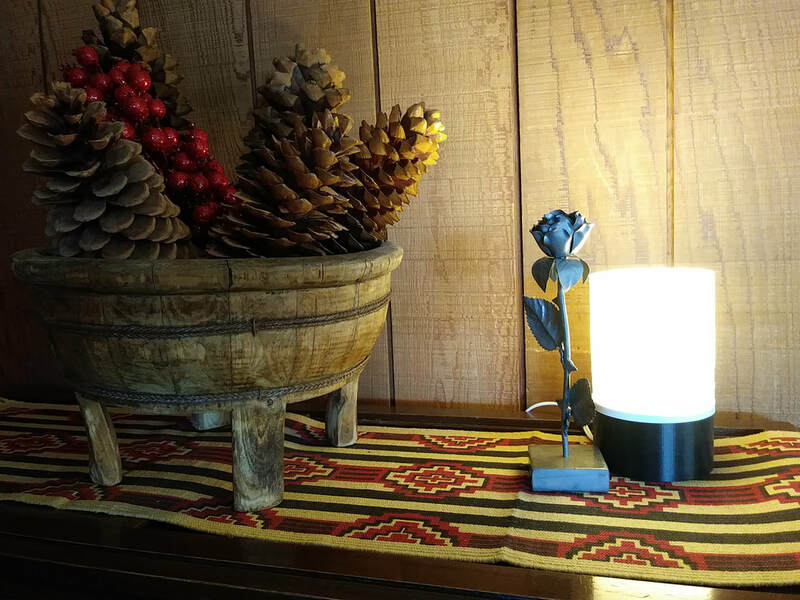 Lamps, Amazon Echo cases, custom products you design. High volume 3D printing services, such as Slant 3D, are able to produce these types of products for you. And just like Tee-shirts or other traditional branded products, there is no cost until the item is sold. Brands can run limited edition preordering campaigns on original designs, building a closer fan base and source of revenue. Influencers can promote merchandise other than tee-shirts as giveaways and and promotions. This all helps youtubers, instagram influencers, corporate brands, and even the new companies getting started to establish themselves without huge investment. All that is required to get started is an idea. Designers at Slant 3D will help you turn it into reality. Just submit you brand and concept for branded merchandise and we will work with you to put into production with 3D printing. There are no minimum orders and the products do not have to be created until they have been ordered. Products can be created with production 3D printing that are more beautiful and original than any other. The process allows designers to create freely and not worry about the cost of manufacturing. 3D printing is often considered a second-rate manufacturing process. Something that is alright for rough prototypes but never for final products. But this idea often comes from experiences with low-grade desktop machines operated by amateurs. Professional 3D printing machines, and operators have thousands of hours of skill and validation built up to make sure that the results are consistent and high quality. Assumptions from what was observed in a garage of a friend are generally wrong when it comes to production 3D printing. But even if they weren't, the flexibility of the process allows designers to create more freely than ever before. And the mild downsides in quality can be overcome quite readily. A prime example of this are the beautiful 3D printed table lamps created by Gantri. 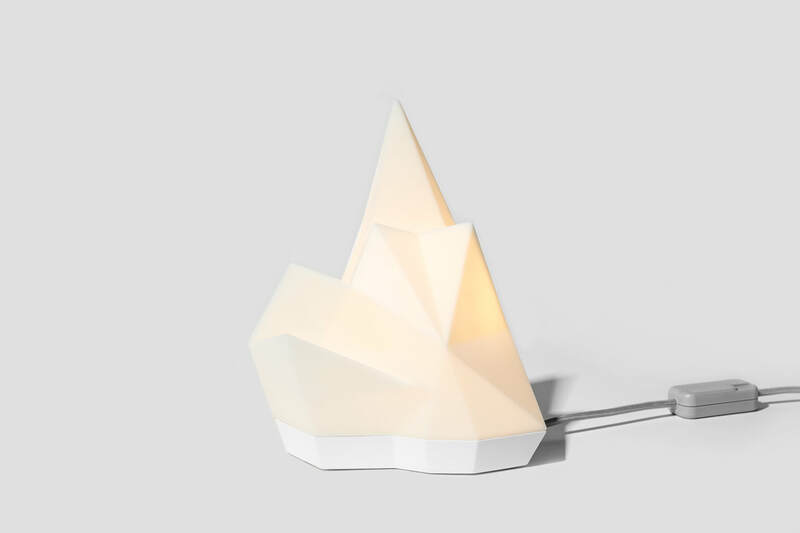 Gantri is a San Francisco-based startup that is determined to bring 3D printed products into the home. And they are doing it by created phenomenally beautiful and unique lamps that are 3D printed except for the electrical components. By using 3D printing as the manufacturing method Gantri is able to to pursue the "long tail" products, which would be to expensive to produce with traditional methods for the volumes that can be sold. 3D printing lets them be ultra-niche. But the design of the products is a beautiful example of how 3D printing does not create a "low quality" product. Especially if the product is designed specifically for additive manufacturing. When a part is printed Gantri employees run the parts through a finishing process. And then perform final assembly. This makes sure that the parts are sleek and beautiful. Ensuring they have built product that people love. 3D printing is not some inferior manufacturing method that should be reserved for rough-outs. It is an affordable, and scalable means of manufacturing final products without the huge startup and long term costs of traditional manufacturing. ​See More Beautiful 3D Printed Lamp at the Gantri Webstore. Interested in having your product manufactured with 3D printing. Get a 3D printing quote today from Slant 3D. Toys are a product that is is constantly changing. But the cost of the molding and traditional setups often make manufacturing toys prohibitively expensive for the lone garage inventor. Therefore most toy inventors attempt to license their ideas, but few ever succeed. 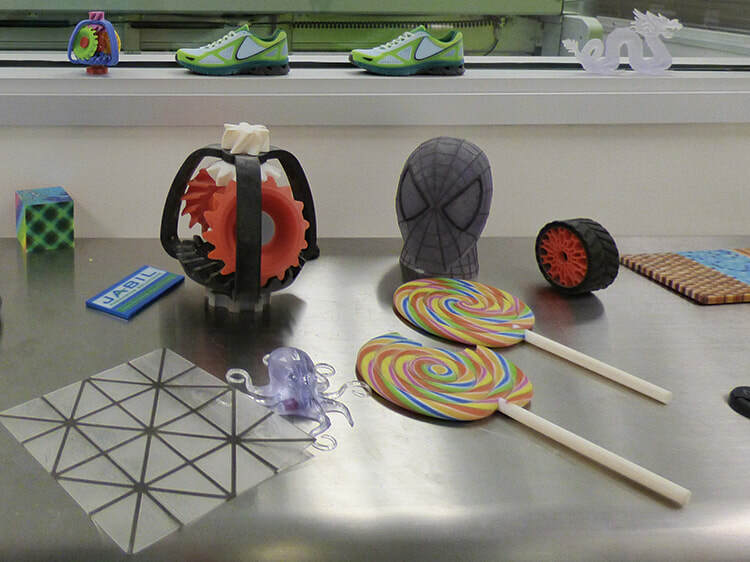 High Volume Production 3D printing offers an alternative to traditional toy manufacturing. It makes manufacturing and selling a toy as easy as making a website to sell it on. You just upload the files and then the printing factory can produce 10 or 10,000 as your sales grow. And, if you utilize the fulfillment capabilities of your 3D printing service then you never even have to pack and ship product. Slant 3D offers all of these resources. You basically just have to create a webstore, upload the 3D printing file, and watch the sales occur as all the manufacturing and fulfillment is handled by Slant 3D. 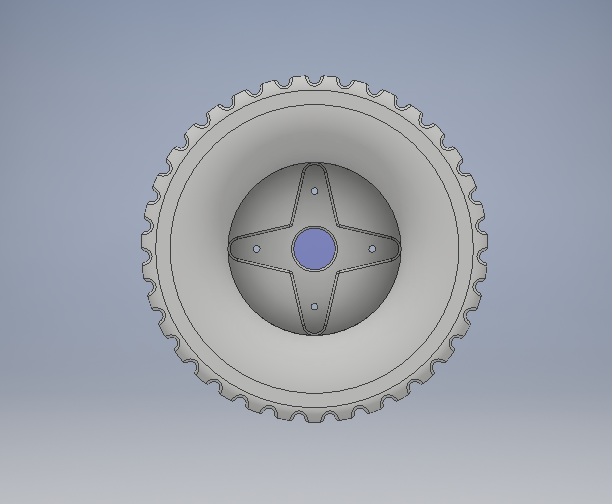 Combine parts to be printed as a single piece. There are very few limits on geometry when 3D printing a plastic part. This makes it possible to create very complex shapes as one single part. Which ultimately means that a toy is cheaper to assemble in production, and safer for the end user since fewer pieces, such as screws, are available to choke on. A great example of using 3D printing to create parts that are simpler to manufacture and safer for children, are the LittleBots. Littlebots are a series of STEM robotics kits. But one of the things that makes them special is that they have very few fasteners. 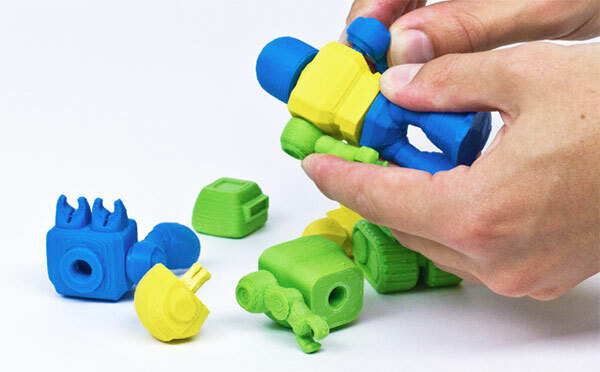 The LittleBots team was able to design each 3D printed piece to snap and join with others without requiring complex assembly. This has made the kits faster and easier to assemble in the classroom, but safer should younger children work with them. The LittleBot Budget uses only 2 screws in the entire assembly of the kit. Few new products ever sell a million in their first year, or even in their lifetime. But molding requires that you order thousands of units at a time. This is a very expensive option for a designer that is just launching a new product and is not sure of the demand. Fortunately 3D printing has no minimum, and is able to scale with demand. An inventor can have a printing service produce just 10 units of an item then, when those are sold, he can grow to 100, then 1000, then 10,000. All without ever having to put down more cash than the individual cost of each item. No tooling, no inventory. Just on-demand manufacturing at any scale. But when your product is on track to sell millions then you can transfer to injection molding without worrying about the risk of the tooling. The last advantage of 3D Printing production is there is no cost in changing the design as you grow. If you utilize injection molding then it is tens of thousands of dollars every time you tweak the product. With 3D printing that is not an issue. You can change the design as much as you want with very small fees to update it in production. The ability of 3D printing to free the toy designer is not often seen. Certainly it can combine assemblies, but those could still have been made with some other process, using more assembly. But 3D printing can create toys that were simply not possible before. Some pieces are just too complex to be made with other processes, period. Great examples of this are the Gualala Gadget toys. These small complex marble towers could not be produced by any other method than 3D printing. Even if the could be broken into small enough pieces to be molded, the resulting product would be expensive and unattractive. 3D printing allows these beautiful toys to be created with basically zero startup cost. Since production 3D printing can make any part, at any time, at any scale there is no reason to build up an inventory of a product. But this can can be taken even further. Instead of purchasing 100 units and holding them in your own warehouse, why not simply have them stored and fulfilled at the source. Slant 3D offers assembly and fulfillment services to clients that do not want to deal with the supply chain. We will print your product, assemble and package it, and implement you into our fulfillment system, This means all you have to do is create the design and create a sellers portal on Ebay, Etsy, Amazon, or your own website. It leaves you free to design more amazing toys. This is a great resource of a product just starting out and for designers that might not be familiar with the logistics of fulfillment. High volume production 3D printing makes it possible to just design the 3D model of a file and immediately start production. Compared to traditional manufacturing the cost of setup is practically zero. And a designer can scale supply as needed, without having to order 1000's upfront. This makes 3D printing essentially a manufacturing backend. Just as a server farm only delivers an app when it it downloaded, production 3D printing can deliver a toy only when it is purchased. Toy inventors and companies now have the capability to test and expand on new ideas in a very low cost scalable way. Interested in having your toy manufactured with 3D printing so that you can spend your time creating more toys and building a business rather than dealing with manufacturing? Get it quoted today!